Railpictures.ca - Dave Burrroughs Photo: Ready for the call to duty, CN 5061-5045 await an assignment at Fort Erie, ON. Less than a year old, these SD-40′s have accumulated enough grime to look older than their age. | Railpictures.ca – Canadian Railway Photography – photographie ferroviaire Canadienne. Copyright Notice: This image ©Dave Burrroughs all rights reserved. 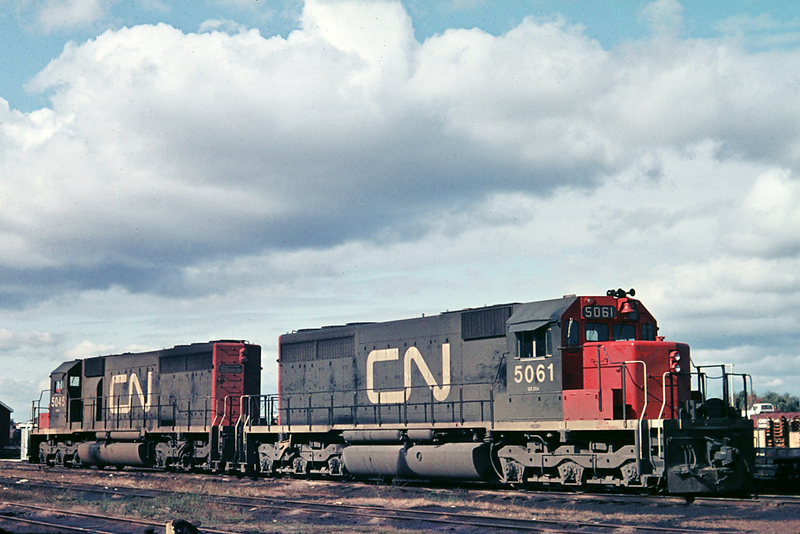 Caption: Ready for the call to duty, CN 5061-5045 await an assignment at Fort Erie, ON. Less than a year old, these SD-40's have accumulated enough grime to look older than their age. @Dave.Yea I am not sure what it is about the SD40, but they ride so well, like a dream. Even the newer -2′s with the snubber (shock absorber) in the centre axle don;t ride as well. I keep hearing this about the ride of the SD-40′s. Don’t hear that about the later production stuff.